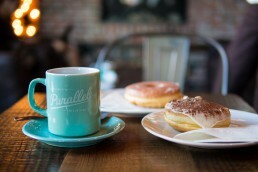 There’s no escaping the fact that 49th Parallel is one of the coolest coffee shops to visit whilst in Vancouver. They’ve been producing some of the finest coffee in the world from their roasters in Vancouver for quite some time. Their beans are sold all over the world (and you get a pretty coloured mug to drink it out of too). Oh and there are doughnuts. Need we say more?